Celebrating July 4th offers so many fun summer time fun opportunities from delicious food to spending time with friends and family to creative activities that can teach kids about our nation’s history. Here are ideas from our Mom experience and nifty resources we found online. Going to see fireworks while awesome for older kids and families, can pose challenges for those with young children by nature of being held so late at night. Focusing on a day time activities like a family picnic may be a more realistic and enjoyable option. Many communities host festivals or parades during the day that can be an easier way to celebrate. For example, check out this list of The Country’s Best July 4th Parades from Red Tricycle. You can also visit a local (age appropriate) history museum or take the opportunity to talk to children about freedom and how our country was founded, ideas suggested by Katie Femia in 7 Ways to Teach Children about Independence Day on the Premeditated Leftovers blog. Finding a location where you can view the fireworks from your car so young children can sleep is another option. We were fortunate when my older son was little to have fireworks in view from near my mother’s house so we could put him reclining in his stroller and not be close to the sounds of it. Some children (like one of my sons) can’t handle the sound of fireworks because of sensory issues or other special needs. 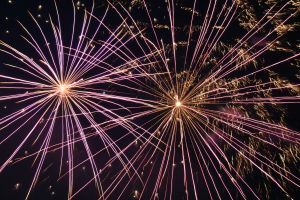 In my article Celebrating July 4th When Your Child Can’t Tolerate the Fireworks I share tips for families who have a child with these issues based on my Mom experiences. While July 4th offers wonderful family time, it can also present safety challenges for those with young children. Kids can be tempted to play with sparklers which cause a big uptick in emergency room visits. We always warned our sons not to play with sparklers, especially concerned that they not be tempted by a friend who might share them when we weren’t looking. We only went to public fireworks displays, not wanting to take any risks trying to do something ourselves when we could go to a big beautiful public display. A hot grill at barbecue time can draw kids who might not understand the repercussions, leading to nasty burns. Distracting kids with a planned activity during grilling time and agreeing on which grown ups will supervise the kids can help avert accidents. What are other safety issues you’ve encountered during July 4th celebrations, and what have you done to avoid them happening? Picnics and barbecues are such a great way to catch up with friends and families and plan activities and crafts to entertain different age level kids. We often plan a family friendly hike followed by the picnic. I love seeing the creative red, white and blue recipes people share on Pinterest and Facebook, for example this fun “flag” made of fruit kabobs on the Two Sisters Review Books blog and this roundup of 16 Easy Patriotic Food Ideas from Red Tricycle. Entering “July 4th Kids Foods” or “Patriotic Kids Foods” in Pinterest provides many great recipes and ideas. What are your favorite activities and foods for July 4th family fun? We’d love to hear your ideas in the comments.